Over the past couple of years, I have been working together with Prof Craig Franklin at The University of Queensland on a review of the effects of ultraviolet radiation (UVR) on amphibians, and its interactions with other environmental factors. 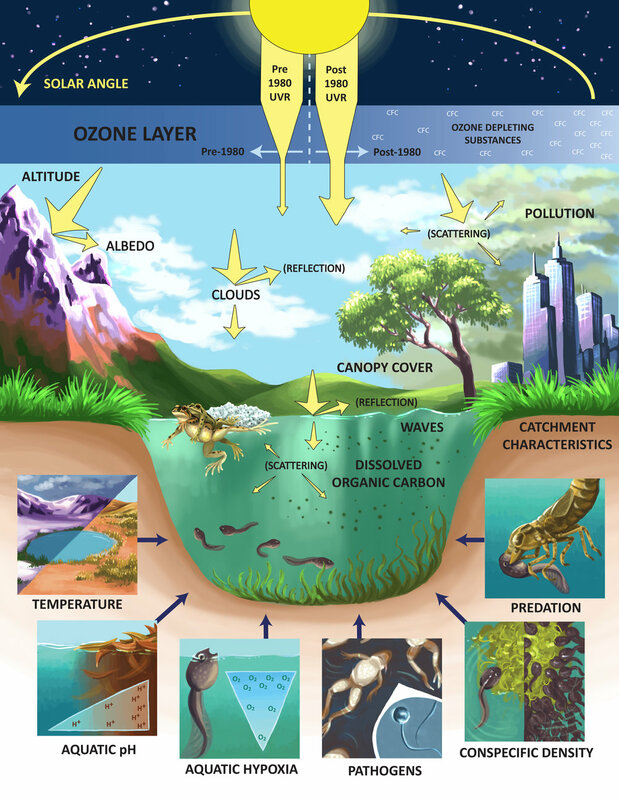 We asked the amazingly talented Elia Pirtle, a PhD student with A/Prof Michael Kearney at The University of Melbourne, to provide us with an illustrated diagram of the environmental factors that effect the transmission of UVR into terrestrial and aquatic habitats, and the environmental factors that can interact with UVR to negatively impact amphibian populations. Below is the result of her efforts, which I wanted to share with you to help publicise her work. If you need a scientific illustration for a logo, a poster, or a paper, or just a nice painting for your office, contact Elia at eliapirtle@gmail.com and visit her website.